Federal and state incentives melt the payback to five years or less. Looking for ways to reduce farm energy bills? Be sure to look beyond the sticker price. State and federal incentives, plus those from utility companies may cut the bill for photovoltaic (electrical) and solar thermal (heat) systems by more than 50%. As reported in April's American Agriculturist, Lippy Brothers' Sunnyside Farms at Westminster, Md., for instance, put up a solar panel array covering almost one acre. 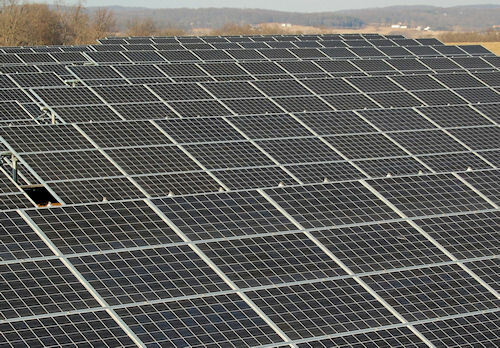 The 936 solar panels provide power for about a third of four poultry houses. When the net-metered system produces more electricity than Sunnyside uses, the excess goes to the grid. The farm gets credited on its power bill. SOLAR IS HEATING UP: Close to 850 farms in the Northeast are cutting electrical energy bills via solar panels with net costs of less than 50% of sticker price. Payback on the $882,000 project is estimated at five years or less – due to grant incentives. A $220,500 USDA Rural Energy for America Program grant knocked 25% of the cost. A $50,000 grant from the Maryland Energy Administration plus a 30% federal investment tax credit made the deal sweeter. Those deal-sweetners account for about 850 Northeast farms with solar systems. According to the 2009 U.S. Ag Census, 44% of solar installation costs are covered by outside sources. It's higher than that in most Northeast states – with New Jersey topping the region with 64%. Last week, N.Y. State Ag Commissioner Darrel Aubertine urged farmers and ag businesses to apply to the state's first incentive program for solar thermal hot water systems. The NYS Energy Research and Development Authority offers up to $25,000 to convert farms and commercial ag businesses from electric hot water to solar. Many ag operations use a lot of hot water, "and electric hot water heaters aren't cheap to operate," he adds. Solar thermal hot water systems can significantly reduce the heating requirements of an electric heater by preheating the water – especially on dairies with less than 100 cows. The NYSERDA grant can be teamed up with USDA's REAP incentive grants plus those of utility companies, confirms NYSERDA President and CEO Francis Murray. If solar thermal technology is installed before December 31, 2012, ag operations are eligible to receive the federal grant covering about 30% of the installed costs. NYS incentives will cover 25% of the installed system up to $5,000. When federal and state tax incentives are combined with this new NYSERDA program, incentives are expected to cover 70% to 75%of installed costs. Only solar thermal systems installed by NYSERDA-approved solar thermal installers qualify. First come, first served. For more details, visit http://www.nyserda.org/funding/2149pon.asp. For more on USDA's REAP grants and guaranteed loans, visit your nearest USDA Rural Development state office or http://www.rurdev.usda.gov/tn/REAP.html on the web.